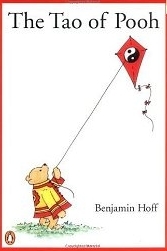 Having discovered this fun and surprisingly insightful book (not to be confused with the polarizing spoof The Tao of Poo) about Taoism during the course of my Chinese and philosophy studies, I was stoked, as the Taoists of the California surf say, when one of my students had to read it in school, so I wrote explanatory notes as a companion to the book. Additional resources on Chinese philosophy can be found on The China Guru, a website I am developing for people interested in China travel, Chinese culture, and the Chinese language. If that describes you, you might find other interesting or useful things there. “Pooh just is.” He doesn’t think too much, worry, or plan. Confucians see the world as an imperfect place in need of being ordered by human beings. Buddhists see the world as a place full of suffering that should be rejected. Taoists see the world as a naturally harmonious place that should be embraced and enjoyed for what it is. Those who think too intellectually or try too hard (too self-consciously), like Rabbit, make things more complicated and difficult; those who think simply and follow their instincts (the pots of honey “calling” Pooh) come up with easy and practical solutions quite naturally. Following the natural order of one’s self (one’s natural personality and inclinations) means being an “uncarved block” (樸) with nothing forced or artificial in one’s behavior. If you try to analyze and define yourself, your behavior is no longer natural and spontaneous. The goal of life should not be to analyze the world from an intellectual distance, but to live in it and be a part of it; Taoism emphasizes direct experience instead of scholarly knowledge. “Knowledge for the sake of knowledge” leads to complications and problems in life instead of simple enjoyment. Qualities that may seem to be weaknesses or limitations in one context can be strengths or advantages in another. Piglet’s small size may be seen a weakness, but he can easily go places that others can’t. We are all useful as long as we appreciate our natural abilities. If you do things self-consciously, you become tense, you make things more complicated than they should be, you try to force your own way on them, and you fail to see easy and obvious solutions. In other words, you make yourself unable to go with the flow. Overthinking also leads to a failure to pay attention to what one is doing at the moment, and that’s how many accidents happen. “Work with circumstances” instead of against them; accept that conditions may not be what you want or expect and adapt to them. Eeyore likes the gifts of the empty pot and the burst balloon because he appreciates them for what they are and doesn’t focus on what they aren’t, what he might have expected them to be. “Fight fire with water.” Don’t resist something directly; use its own nature to your advantage. Bisy Backsons are “type A personalities”—people who are unable to relax and enjoy life but instead must be constantly doing something. They always focus on the future goal of what they’re doing instead of enjoying the moment, so they’re always stressed out. The way American Indians lived in harmony with the land instead of forcing it to grow a crop that it wasn’t suited to is a good example of the opposite of a Bisy Backson. Bisy Backsons think in terms of fighting and overcoming instead of growing and developing. Caring (慈) is the source of courage and wisdom because it is when we care about something that we are motivated to ignore our fear and to seek understanding. “To go nowhere and do nothing is the first step towards finding peace in the Tao.” If we cease to impose our will on the world but appreciate what’s around us, our minds will be peaceful and we will be in harmony with the world. When Eeyore looks at what’s right in front of him instead of assuming that he must come up with a plan to find his missing tail, he finds it. People who can’t find the glasses that they’re already wearing are an example of the opposite of this principle. The empty mind is able to perceive things clearly, absorb the situation, and adapt to it. Small children exist in this state naturally because they are not caught up in a mental world of worries and plans and facts and abstractions. One advantage of an empty mind is that it allows intuition to be felt and allows the subconscious to generate ideas. The “Great Nothing” cannot be described in words because one grasps it by being, not by thinking. Being puts us in touch with reality; thinking separates us from it because it creates an artificial world of abstractions that isn’t real.